Be "environmentally responsible", manage your greywater for the least environmental impact. There are NO environmentally friendly detergents, so "choose to use" those with least known hazards. Domestic wastewater can be categorised as either "blackwater" or "greywater" depending upon the source of the water and its solids loading, as most domestic water has some degree of bacterial contamination. Thinking that water in the toilet is more contaminated than water from the laundry may not be the case, therefore all wastewater should be considered as potentially contaminated by bacteria, some of which may be pathogenic (causing illness). We are walking platforms for numerous microbial species. Even the simple task of washing our hands adds bacteria to the water, as well as soap and other chemicals. 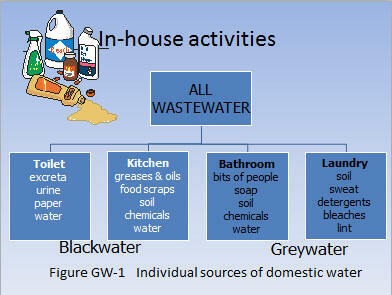 The current use of the terms "blackwater" and "greywater" may be considered in light of their origins as shown in Figure GW-1. While the kitchen wastes may be directed to the greywater system, the septic tank is better able to retain the oils, greases and solids than the greywater system. Are you confused by the two terms? They mean different approaches to the use of treated wastewater (sometimes called "reclaimed water"). The term 'recycling' is used when the water that is treated (reclaimed) is then used back in the home or industry instead of potable water. As an example, water that is used by the home is treated to a sufficient standard that it can be used for toilet flushing, rather than having the toilet cistern connected to potable water supply is an example of recycling. Wastewater that is treated by a municipal authority and then distributed in a separate pipe for toilet flushing, garden watering, washing the car or laundry use is 'recycling'. The term 'reuse' refers to an additional use of the water after simple treatment (adequate for the task). Taking laundry water and watering the lawn without any treatment is reuse. Treating water by filtration so that is can be pumped and distributed by subsurface pressure irrigation is still 'reuse', even though it replaces potable water for that purpose. BLACKWATER - wastewater generated in the toilet and kitchen. But you ask "Why water from the kitchen?" The kitchen wastewater is a source of oils, greases and fats from cooking and food preparation. In years gone by, homes were equipped with a grease trap, small boxes in the wastewater discharge line that were supposed to separate grease from water. In many cases these grease traps were poorly maintained (often not maintained) and failed to protect the system from those greases. In our modern kitchen, the animal fats and lards have been replaced by vegetable oils and these oils are liquid at normal temperatures and will not settle out in a grease trap. Modern detergents also bind with the oils and so prevent their separation. Therefore, mixing the kitchen wastewater stream with the solids rich load from the toilet assists in removing the greases and eliminates the need to regularly clean out smelly grease traps. It's not hard to understand why toilet water is excluded from discharging on land except after adequate treatment to reduce the potentially pathogenic bacteria from contaminating the environment. Many options are available for treating human waste, from waterless composting toilets, to aerated wastewater treatment systems, secondary treatment in a sand filter or a peat biofilter or simple treatment in a septic tank with subsurface discharge into appropriately designed drainfields. But the discussion about blackwater, its composition and treatment processes is not explored in these pages. See the information under SEPTIC TANKS (click here to transfer). GREYWATER - water generated in the shower, bath, hand-basin, and laundry. The water from the spa requires separate treatment because of its quality and large volume and needs to be discharged separately. Greywater has a highly variable chemistry depending upon the activities of the residents and the volume of water and the chemicals (type and quantity) used. Just consider for a moment what happens with body sweat, hair, skin, bacteria from the body and the other bits of us that we wash down the sink - about 2 kg of skin, hair and body exudates per person per year. The greywater, therefore, has not only solids, greases and dissolved salts but also foreign particles such as soil, sand, bone, soap and the minerals in the original water. Many of the chemicals we use are detrimental to plants and soil so control over the quantity that enters greywater need to be considered when greywater is to be used as an irrigation resource. It's not that we shouldn't reuse greywater, just that we must understand some of the consequences of not using it wisely. Avoiding the use of many chemicals is simply a better outcome than trying to adequately treat the water. That avoidance applies equally to a single domestic residence as to a whole metropolitan community. Not all bacteria have the potential to make us sick, indeed there are many bacteria that are essential to life support. The bacteria on our skins, in our saliva and in the various parts of the digestive system all have a function to keep us going. Many bacteria are potentially harmful and you only have to get a touch of food poisoning (Salmonella spp) to realise some bacteria are not very good for us. The environment is full of bacteria, in every nook and crevice, in the air, in water and in the soil. Whether those bacteria are potentially harmful is the answer to the question we need to ask. Testing for bacteria is a specialist's task and interpreting the results is not always straight forward. What we need to understand is that some of the species of bacteria that we wash from our bodies, out of our clothes, from animals around us (domestic and wild) and from the environment in which we move are potentially harmful to our good health. Greywater has the potential for carrying many harmful bacteria (pathogens) and we should eliminate most of the opportunities for those bacteria coming in contact with people, or family pets. We cannot "prevent" but we can "minimise" or "protect" against infection. If in doubt about your greywater, consider it has some pathogens and treat it accordingly. Some people may think that ice is hard water and snow is soft water, but it has nothing to do with the phase of water (solid, liquid or gas). The hardness of water is an aesthetic description of how well the soap lathers in the water. Before the advent of chemical detergents after WWII (1939-1945), soap was the only cleaning agent used for clothes and personal care. Unfortunately, soap combines with calcium and magnesium ions to form a residue (scum) that clings to clothes, skin, hair, crockery, baths and basins. The "ring around the water mark" in the bath is the result of soap combining with calcium and magnesium. To overcome this problem, just use more soap until all the hardness reacts with the soap and some soap is left for washing. Then the issue of how effective is the rinsing operation in removing the scum and leaving the clothes clean..
Chemical detergents use surface active agents ("surfactants") to create the washing action and "builders" to remove the calcium and magnesium and prevent these two elements from reducing the washing action of the surfactants. The harder the water, the more detergent, but now there is no "scum" because the builders keep the calcium and magnesium compounds in the water so they could be easily washed out. Bingo! Hard water problem solved without the nasty scum. Shower gels and body lotions do the same with body oils, removing them with water so that our skin is not only clean but feels clean. Hard water has enough calcium and/or magnesium to reduce the cleaning potential of the soap or detergent. The hardness is calculated from the concentration of calcium and magnesium ions in the water and reported in milligrams per litre of calcium carbonate (CaCO3) equivalent. A German unit (dH) may be referred to by European washing machine and dishwasher manufacturers (1 dH = 17.8 mg/L CaCO3). On a scale of hardness, less than 70 mg/L CaCO3 is rated as soft; 70-140 mg/L slightly hard, 140-210 mg/L medium hard. Some town water supplies are extremely hard and not the most pleasant to wash with - unfortunately that hardness is mostly related to geology and costly to overcome. Rain water is ALWAYS soft, hence the recommended dose of detergent can almost always be reduced. Many bore water sources are very hard and will require increased doses of detergent to overcome the hardness. You need to judge the quality of the water yourself and adjust the dose accordingly.......don't blindly follow the manufacturers' recommendation, as all water is not the same. Refer to additional information on the "hardness" page. The volume of water that can be separated into these two components (blackwater and greywater) varies with the house plumbing and the type of fixtures that determine flow rates. Many water conservation devices are available to reduce water use, such as the modern toilet cistern that delivers either 6 L for flushing of solids and 3 L for flushing liquid, compared with the cistern of 30 years ago that had a single 11 L flush and the early dual flush toilet that was 11/5.5 L. Many motels, hotels, government buildings and the vast majority of private homes still have these older cisterns to the detriment of our overall community's water consumption. Changing to a 6/3 L flush system is a permanent and irreversible water conservation approach (irreversible in that you now cannot buy an 11 L flush toilet, and why would you want to?). Why don't we have rebates for changing all the toilets, everywhere, even in existing buildings. Why aren't government buildings leading that charge? Be aware, though, that for a household with a septic tank that there is enough flushing water to push the solids through the drainage system into the septic tank. Insufficient flushing water may lead to build up of solids in the waste pipe, eventually leading to a blockage. Water conservation of the greywater inputs is easier to implement with fixtures that reduce the amount of water used. Low-flow shower roses reduce water flow from 12-15 L per minute to 9 L, or less, per minute. There's no point slowing the flow of water into a bath, it just takes longer to fill the bath to an appropriate level. It's easier to use less water in the bath. Over the hand-basin, an aerator fitted to the tap spout will give the illusion of a higher water flow and a lower water use will result. There are also replacement tap washers that make it more inconvenient to turn the tap on 'full-bore' with the resulting reduction in water use. In the laundry there are several methods of conserving water, but I do not advocate changing washing machines just to save a few dollars of water. See the section on washing machines before making any firm decision. And don't be conned by Government rebates! Do your sums first! Consider also the cost of energy used for a full wash.
What is important is the selection of laundry detergents that firstly, clean your clothes (that's number one priority) and secondly, do not create such a concoction of chemicals that may be detrimental to plants or soil when the greywater is discharged to a land application area. But be aware, if you conserve water and use the same amount of detergent, the chemical load will increase and the potential environmental outcome may be more severe. In some instances, water conservation in the home may reduce the quantity and quality of greywater to volumes to a point where they are not worth reusing. After assessing the process required to treat greywater to an appropriate standard for use as irrigation water or meet the Government's regulations, you also need to consider the cost of distributing the water over sufficient land area to minimise problems with salinity, sodicity or the effects of high pH water. While Governments have condoned bucketing greywater to anywhere in the garden yet require water that is stored for more than 24 hours to be fully treated, the application rate of greywater will depend upon the chemistry of the water, not the political aspects. Unfortunately you will need to meet the legislative requirements, even though many of the guidelines are misguided. In many cases, you will find it is easier and environmentally sound to look at reducing water within the home through water conservation measures and collecting rainwater for use in the garden. Greywater reuse in many situations is "environmentally hazardous" and not very economical. You need to consider your situation carefully and don't be swayed by government imperatives......government won't compensate you when you kill your garden. A warm and fuzzy feeling is not a sound alternative to economic logic. Opportunities to reuse domestic greywater around the home are not numerous and most of what these pages will discuss is simply reuse of adequately treated greywater for irrigation of gardens and lawns. Reuse is different from recycling. Reuse simply suggests that after using the water in the home (for showers, baths and laundry) that the greywater has another use before it is lost back to the natural water cycle. Recycling, on the other hand is treating the greywater to an appropriate level that it can be used in place of drinking water for lower grade purposes such as flushing toilets, washing motor vehicles, or recycling for washing machine water. These pages will not explore recycling opportunities because of the significant financial costs involved in meeting the "appropriate treatment" criteria while having confidence that the risk of public health or environmental harm is sufficiently low. Be aware, no one can afford to have "No Risk" situations because you have only limited control over the quality of the greywater stream. Recycling is not beyond treatment at the single household level, but the money could be more wisely spent in other areas of water collection (rainwater and stormwater), in low water use gardens and many other activities. So let's confine this discussion to "reuse". Wastewater directly from the bath or washing machine should not be simply directed through diversion devices without at least filtration. Bath or shower water may contain hair, while laundry water will contain lint. These wastes can foul lines and leave 'tell tale' debris on the disposal area. Simple filtration can be provided by placing an old nylon stocking over the end of the pipe that discharges into the pump-well. Remember, that stocking filter needs to be maintained in an operational condition. Water from rinsing, soaking or preparing nappies for wash should be discharged to the blackwater system and not surface spread on the ground. If chlorine bleach is used to soak nappies, or some of the 'oxygen rich' products (contain percarbonate, or peroxides), don't dispose of that water onto your lawn or garden. These disinfectants are likely to have detrimental effects on the soil microbes that are essential for nutrient cycling. If all Australians were the same we could expect to have the same rules and regulations regarding greywater reuse on our suburban or urban lot. It appears we are not the same because there are different rules for not only different states but also in different local government areas. If you are prepared to bucket out your greywater, then anything goes, anywhere, anytime, any amount !! But if you would like to plumb a system that is not only aesthetic but also practical - be aware of the local rules! NSW has amended (from 1 July 2006) the Local Government (General) Regulation 2005 with regulation 75A. For fear of misrepresenting the legal interpretation of this clause, you need to read the actual words yourself. Go to http://www.austlii.edu.au/au/legis/nsw/consol_reg/ for the NSW Consolidated Regulations. Click on <Database Search>, then in the new screen type in "greywater" in the empty box. Find the entry that refers to the Local Government (General) Regulation 2005. Of course, you will be familiar with the "Plumbing and Drainage Code of Practice" (can be downloaded free from http://www.water.nsw.gov.au/Urban-Water/Plumbing/default.aspx). Or will the sales person at the local hardware store know? Or will the advertising with the greywater device let you know whether it complies or not? But if you already have an on-site system you will need Council approval to divert your greywater - unless you carry it out in a bucket. If you want to collect, store and treat the greywater, you will always require approval from your local Council. And watch out for some more paperwork, the NSW Department of Energy, Utilities and Sustainability (DEUS) is preparing a "NSW Guideline for Sewered Residential Premises (Single Households) Greywater Reuse" that will probably be out early 2007. To quote from the draft document " "By following the management controls identified in this guideline greywater diversion may be carried out without the approval of Council, provided the conditions described in Section 4.2 are met. Greywater treatment systems continue to require prior approval from Council". And like the ads on TV - and there's more!!! Health NSW is the accrediting body for greywater treatment systems and also has a set of greywater guidelines (http://www.health.nsw.gov.au). Lanfax Labs will attempt (but make no promises) to update this page as further information becomes available, however, it is not possible for us to keep abreast of all the legislation in all states. Until the DEUS guidelines are in place - greywater diversion requires Council approval. And when you have done that, you can only use the water by subsurface irrigation at a depth of 100 mm or more. Greywater Treatment Systems require Council approval in NSW and only systems that are accredited by NSW Health as greywater systems can be installed. You are still ONLY allowed to irrigate into subsurface soils. powders with pH less than 10 may be acceptable, the lower the better for greywater irrigation. SALINITY of all products for both machine types - go back to the page on "salinity"
The measure of salinity is related to electrical conductivity as explained previously. Salinity is reported in units of milligrams per litre (mg/L) while electrical conductivity is in units of deciSiemens per metre (dS/m). A guidance value of 1 dS/m will give an indication of the potential for the greywater to be a hazard to soil or plants - a guidance value only. SODICITY of all products for both machine types - see the pages on "sodium" and "sodium adsorption ratio"
You must have some sense of the effects of sodium on soil and plants by now, if not read back through earlier sections. We have already seen that some powders have very high sodium values. Therefore, it is relatively easy to choose low sodium products, although that is not possible from the labelling on the laundry detergents. So if you had to make a choice and select a low sodium product, Figure L&P-Na shows that the powders that fall into that category. You will have to refer back to the sodium section to match brand names. AS a suggestion, a level less than 20 g/wash will suit an irrigation area of about 200 m2. Or you will have to dilute the water and spread it further. Whether or not you think that phosphorus in laundry detergents is an 'environmentally nasty' elements will depend upon how you intend to use the greywater from the laundry and the soil type in your garden. Phosphorus in river systems is 'environmentally nasty', but most of the phosphorus that enters waters is attached to soil particles, unless you are on nothing but sands. So, if you can minimise loss of soil (erosion), then you also minimise the loss of phosphorus. Refer to the section on phosphorus. Remember: The 7.8 g P/wash is a voluntary standard and has no scientific basis. In NSW, The Department of Environment, Conservation and Climate Change and Water (DECCW) impose licence limits on sewage treatment plants of 1.0 mg/L and are working towards a 0.3 mg P/L in effluent discharges. electrical conductivity less than 1.0 dS/m. These values are used as a guide only to show that it is possible to choose products that meet specific limits. Price per wash and many other variables could be added. This list is not an endorsement of these products, nor a rejection of the products not on the table because the limits will change according to each unique set of conditions - soil, plants, irrigation rate, frequency, drainage, rainfall. The table is simply to show that products can be selected on multiple properties. Purity Sensitive no P, and Blitz Clean breeze NP did not meet the pH criteria, although Blitz not recommended for front loaders. So what if the same limits were applied to powder detergents? We have a real problem doing the same sort on the powders because the limits we tried for liquids are not achieved for any of the powders, that is, none of the powders has pH < 8.0; some have sodium load less than 10.0 grams per wash; many phosphorus load less than 1.0 gram per wash; and a couple with electrical conductivity less than 1.0 dS/m. We will have to reset the parameters. So we now do not have a level playing field! electrical conductivity less than 2.2 dS/m. REMINDER: Please do not contact Lanfax Labs with your request for further information or a discussion on the above. This website is provided free of charge and there is no more information for the same price! Lanfax Labs is happy to provide additional information at a "fee for service", or to test products for you "for a fee".